And it can be added that also simply and cheaply. 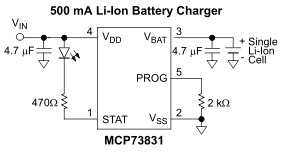 MCP73831 from company Microchip is „all-in-one“ solution for charging a single Li-ion/Li-Po cell. This is an archive article published 17.04.2015. Some information may no longer be up to date and in line with the current state. Please contact us in case of interest. Li-Ion a Li-Polymer cells are becoming a No.1 choice for many applications, where they persuade by high energy density, low weight, low self-discharge and for majority of applications also by their favorable flat shape (Li-Po). Their price is also affordable (in regard to their properties) and so there´s usually only one “difficulty” - to solve charging, or more exactly - overall management of these cells. Basic principles were highlighted to you in our article "Try the most favourite types of batteries". To reach a maximum cell lifetime, it´s also advisable to use initial (preconditioning) slow charging and also important is a proper charging termination as well as repeated recharging after reaching a certain degree of discharge. It´s obvious, that to construct such a circuit from discrete components would be possible, but impractical, bulky and expensive. That´s why there are various charging controllers on the market and in many cases a single chip solution is an ideal solution. This is also a case of MCP73831 chip - a fully integrated linear charging controller. If you use only a single cell and maximum charging current of 500mA is sufficient for you, then MCP73831 will meet all requirements for a quality and safe recharging solution. MCP73831 has integrated output (FET) transistor, current sensing and reverse discharge protection. Charging current can be easily adjusted by a single resistor, what´s also associated with other parameters like preconditioning current and charging termination. 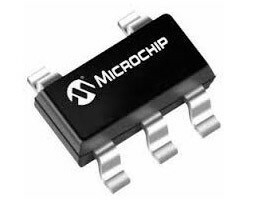 MCP73831 also contains a thermal regulation, which decreases output current in case of increased chip temperature (for example because of higher ambient temperature). MCP7383x is available in four versions with factory-set regulation (max. charging) voltage. In our store can be found “the safest” first version with 4.20V regulation voltage - MCP73831T-2ATI/OT. In datasheet (p. 25) we can also read that this is the “AT“ version, which starts repeated charging at 94% Vreg (i.e. at approx. 3.95V), in a SOT23-5 package. Supply voltage can be in a range of 3.75-6V, while in respect to a thermal stress of a chip it´s better to supply it by a voltage close to max. output voltage (4,20V). The chip can be easily supplied by a standard 5V voltage, but in cases of increased risk of overheating (operation at higher ambient temperatures, densely populated PCB,...), a common Si diode in series can be helpful. This will decrease supply voltage in 0.6-0.7V (and takes a portion of thermal loss on itself). Charging status can be found at the "Charge status output" pin, which can drive an indication LED or can be connected to a host microcontroller. In case of interest in any Microchip component, please contact us at info@soselectronic.com.